Believe it or not, worry isn’t necessarily a bad thing. Like all emotions, it is simply the presence of energy in motion, and when managed properly, it can serve as an impetus for effective, meaningful action. Unfortunately, it’s easy to become a victim of our worries, often resulting in a feeling of helplessness. Below is an example of what I call a worry thought attack. Triggered by a specific event and void of any self-awareness, thought attacks can take on a life of their own. Triggering event – A student receives a low score on a test. Worry thought #1 – Oh great, I can’t believe this happened. Worry thought #2 – Now my teacher is going to lose complete trust in me. Worry thought #3 – My parents are probably going to ground me forever. Worry thought #4 – I’m going to fail 6th grade. Notice how the worry gained momentum as the thoughts continued? What started as a simple concern eventually turned into an extreme fear. 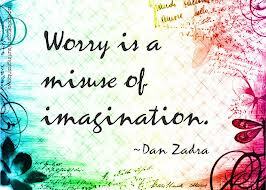 This is a great example of how a worry can completely consume our thoughts. What can you do when you feel a worry thought attack coming on? Below is a three step method I teach as part of my Lenses of Leadership program, which encourages students to use the worry instead of letting it use them. Step 1 – CATCH your worry thoughts. This is the self-awareness portion of the strategy. The majority of our thoughts are subconscious (out of our awareness), so it’s critical that we monitor our inner dialogue and catch the worry before it takes on a life of its own. Step 2 – OWN your worry thoughts. Owning your thoughts simply means that you accept the fact that your present level of thinking isn’t serving you well. Step 3 – REPLACE your lens. It’s important to note that your circumstances (which in this case was a low test score) do not have the power to control your feelings, unless you give them permission to. The powerless lens would have you believe that it was the test score that caused the worry and thus lead to further worrisome thoughts and feelings. However, the gratitude lens would allow you to see the opportunity that lies ahead with regard to improving your grade. In this case, the resulting feelings would be hope and optimism. Unfortunately, it’s not as easy to manage our worries as Bobby McFerrin would have us believe. Although I love his hit song “Don’t Worry Be Happy”, our feelings are not something we can simply turn off, or stop feeling. That is why I prefer the term emotional management (see previous blog) as opposed to emotional control.